Ch. 1 - Making the Case for Holiness - My Catholic Life! Why would you want to seek holiness? Moreover, what exactly does that mean? On a theoretical level, becoming holy sounds intriguing, inviting, mysterious and admirable. However, do YOU want to become holy? Too often, when faced with that question, the first thing that comes to mind is, “What will I have to give up?” Holiness is often seen in a negative way, meaning those who are holy are often seen as admirable people who have given up most of what is “fun” in life. When you think of someone who is holy, who comes to mind first? A famous saint? A humble priest? A cloistered nun? A loving aunt or grandma? Whoever comes to mind, they are often seen as good people we admire but have chosen not to imitate. Why is that? The goal of this first chapter is to make the case that holiness is something that want to strive to attain. In fact, it is something that you deeply want to achieve, whether you realize it or not. No, achieving a life of holiness is not easy. It’s not a life filled with “doing what you want because you want to do it.” Goals like that are very superficial and are never fully achievable. We are all made with an innate desire for happiness. The problem is that most often we become confused as to how we achieve the happiness we desire. Some constantly dream of becoming rich. However, think about it honestly. If you won $100 million dollars, would that make you happy? Perhaps that is hard to answer, because, on the surface, this may be very desirable. Think about all you could do with such riches! The truth, however, is that all the money in the world will not make you happier. There have even been various in-depth studies that have shown that people who win the lottery actually do not achieve a greater degree of happiness. Sure, lots of money may relieve a certain amount of stress, make life easier in some ways and allow you to do many fun things. However, at the end of the day, neither money, fame, prestige, success nor anything else this world holds in high esteem will make you happier in the truest sense. Think also of the deception that “fame” will make you happy. For example, if you were a famous actor, a powerful politician or a prominent entrepreneur, would your status equate to instant fulfillment in life? Again, there will always be a certain level of satisfaction that comes with success and fame, but it is not very deep and will leave you wanting only more. Some years ago there was an interview written in a national paper with a very famous actress from Hollywood. In that interview, the actress shared that she often goes back to her hotel room after large parties and suddenly finds herself feeling very lonely. One would think that if you were a famous actress coming home from one of the best social gatherings in Hollywood you’d be feeling pretty good, not lonely. However, happiness is not something that the world can give. It never comes with riches, fame or worldly success. It’s something much deeper and can be obtained by anyone. Some years ago, a seminarian from the United States spent the summer in a foreign country learning the language and culture. He spent one week in a very poor country village where many homes had dirt floors. One day, one of the local farmers engaged the seminarian in conversation. The seminarian had spent the week feeling bad about the poverty in which the locals lived, so he wasn’t prepared for what the farmer said to him. The farmer looked at him, smiled and said, “You poor Americans! You have so many things and are always so busy with life. Look at me! I have everything I could want. I spend the day with my sheep and in my fields. I have a wonderful family and all that I could want.” The seminarian went away from that conversation surprised yet intrigued at how this elderly man pitied him for his material wealth and social status! What is true happiness? Simply put, happiness is holiness. Holiness is the only way to complete fulfillment in life. Nothing else can come close to satisfying the deep longing you feel in your heart. As Saint Augustine famously said, “Our hearts are restless until they rest in You, oh Lord.” Do you find that your heart is restless at times? Do you find that there is something missing in your life? What is it? What can fill that void that you feel? If you can accept the fact that holiness is what makes you happy, the next most important question is this: What does it mean to be holy? Is holiness simply a life of pious devotions, going to church all the time, staying out of trouble, being nice to everyone and being an all-around good person? Maybe it is to a certain extent, but that is a very simplistic definition of holiness, which also fails in its complete accuracy. True holiness, in its deepest form, requires a profound definition. It means you have humbly surrendered every part of your life to God, have given of yourself freely to others without reserve, have chosen to embrace all suffering in life with love, have chosen to unite it to the Cross of Christ, and have chosen to abandon everything this world offers as good, choosing instead the riches of Heaven. Sound inviting? Perhaps not at first. However, if you understood these defining qualities of holiness, you would desire them with all your soul. But if that definition of holiness is a bit too much at first, don’t worry just yet. That very profound definition will be unpacked carefully and thoroughly for the rest of this book. Recall these words of Jesus, “For whoever wishes to save his life will lose it, but whoever loses his life for my sake will save it” (Luke 9:24). “Losing” our lives means we learn to overcome selfishness and choose, instead, to give ourselves to others without counting the cost. Only when we do this do we discover who we are and become who we were made to be. In other words, when you actively live in a selfless way, two things happen. First, you “discover” your very self. You discover what it means to be human according to the design of God. God made you to be selfless, and it is only in the act of being selfless that you discover this profound truth of who you are. Second, as you discover who you were made to be, you also become that person. By acting in a selfless way, you become selfless and, thus, you become more fully human in the sense that you become who God made you to be. This process of self-discovery and self-transformation is eye-opening and glorious! For example, recall the familiar Christmas story of Ebenezer Scrooge. In that story, Ebenezer lived a very self-centered life in which his only concern was for himself and his riches. After his nighttime encounter with the ghosts of Christmas past, present and future, his eyes were opened. He woke up realizing that giving of himself to others and putting the needs of others first was what he was missing in life. As a result, his newly discovered life of charity toward others filled him with the utmost happiness. In that story, Ebenezer discovered who he was made to be and became who he was by his acts of selfless charity. This form of discovery is one that we must all seek to make if we are to discover the purpose of our lives and become holy. Holiness also means that we allow the hardships of life and all the suffering we endure to become a source of union with God rather than an obstacle in our relationship with Him. This is no easy task! When we suffer we are immediately tempted toward selfishness and tend to look only at the wounds we have received. For example, if someone has a very painful toothache, it may be difficult to think about others in the midst of the pain. But suffering and holiness are not actually opposed to each other. And for that reason, suffering and happiness are not opposed to each other. On the contrary, suffering can actually become a source of the greatest fulfillment in life when it is transformed by grace. Think about our Lord’s life. He lived holiness in human form to its perfection and is, therefore, its perfect model. He was God. He was filled with every virtue and loved all people in an unconditional way. However, He was ultimately hated by many, was persecuted and was murdered. Yet through it all, He accepted every suffering without hesitation, transforming it into an act of sacrificial love. The insightful question is this: Was Jesus happy in this world? Did the suffering He endured steal away His human fulfillment? These are very important questions to answer. In truth, Jesus took deep delight in being able to give of Himself in a totally selfless way, accepting persecution and death unjustly, transforming it into sacrificial love, and finding great happiness in the process. Though this last statement is packed with deep meaning, we should know that Jesus was perfectly happy in life. In fact, His joy increased as He was invited, by the will of the Father, to sacrifice His life for the salvation of the world. The suffering and persecution He endured did not decrease His happiness. Rather, it had the effect of increasing His happiness on account of the fact that He embraced His suffering in love. When love becomes your response to persecution and other forms of suffering, your soul is transformed and made more fully into the likeness of Christ. It is this transformation that brings about a depth of fulfillment in life that cannot be equaled. Yes, Jesus was divine. Therefore, it may be hard to believe that you can imitate His example and fully share in His likeness. However, that is exactly what you are called to do in life. You are called to “be perfect” as God Himself is perfect (see Matthew 5:48). If you can believe that Jesus’ life is the ideal you are to imitate, then you are ready to start down the path to holiness. It is much easier to believe what you should do than to do what you believe. Our minds can often grasp the ideal, but our will often struggle in choosing that ideal. However, understanding the two-step process is helpful. Believing comes first. Your mind must first seek to grasp the ideal you are called to imitate. You must seek to understand the perfection of the life of Christ as your model. You must ponder the will of God and grasp the life of virtue He has chosen for you by the example He set. However, knowing God and His holy will is only the first step. From there, you must let what you have come to know through faith move into your will so that your heart can change. As your convictions of faith move from your head to your will, you are strengthened to choose and live the will of God. It is only when the human will is conformed to the will of God that you begin to become holy. With the transformation of your will, your heart is filled with the presence of God. By analogy, imagine you want to lose weight. As a result, you spend a few weeks reading up on all of the latest weight loss programs. In that time, you become somewhat of an expert on what works and what doesn’t. You study the reviews of many forms of dieting and even buy the right foods and dietary supplements. But learning about weight loss is much different than losing weight. In order for all the information you have studied about the best weight loss programs to bear fruit in your life, you have to start to live those programs. So it is with holiness. The transition of the will of God from your head to your will is not easy. It requires much virtue and much conversion. It can only be done one step at a time. However, if you choose to embark on that journey, and continue down that road, you will begin to see progress as your life is transformed. One of the most important ways we begin this journey is through concrete and practical steps. We must examine the mind and will of God in detail. We must then evaluate our own minds in the light of this revelation and we must allow grace to change our thinking, our actions and ultimately our hearts, desires, passion and even feelings. An important initial decision on your part is to make the choice to embark on the “path of no return.” Recall Jesus’ words, “No one who sets a hand to the plow and looks to what was left behind is fit for the kingdom of God” (Luke 9:62). If you can agree with the basic premise that you were made for holiness and that holiness is the path to human fulfillment and, therefore, the path to happiness, then make the commitment to seek to obtain it. 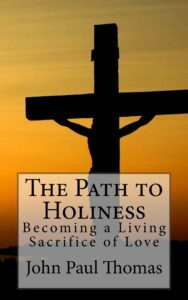 Seek to obtain a life of holiness and use the practical reflections that follow as guideposts on that journey.